Did you know that a lot of people with skin irritations are reacting to the laundry detergent left behind on their clothes – and they don’t even know it? I have had guests at Norwex demos tell me it’s taken them MONTHS to realise that it’s their washing powder (or liquid!) that is causing their skin sensitivities. Often, they haven’t even changed brands, they’ve just suddenly become sensitive to it. I have also had customers who know full well they can’t use ANY supermarket laundry powder brands, because they (or someone in their household) reacts to all of them. Sometimes they’ve just been using soap flakes, or other times they might use homemade laundry detergent (so they know what’s in it), because they end up with eczema or other allergic reactions to everything else. Would you like to know what the two most common ingredients people react to in laundry detergent are? I have a whole other blog post on fillers in laundry detergent, so I won’t repeat all that here, but suffice it to say that they can be made up of a number of ingredients, and they tend to stay in both the fibres of your clothes, and the hoses of your machine. (That’s why we recommend doing a machine wash when you first start using the Norwex washing powder, without your clothes in it). Artificial fragrances can be made up of thousands of chemicals, and generally contain phthalates, which are known hormone system disruptors. That means they can interfere with your body’s fertility, sleep, hunger and weight management systems, among other things, as well as being irritants! 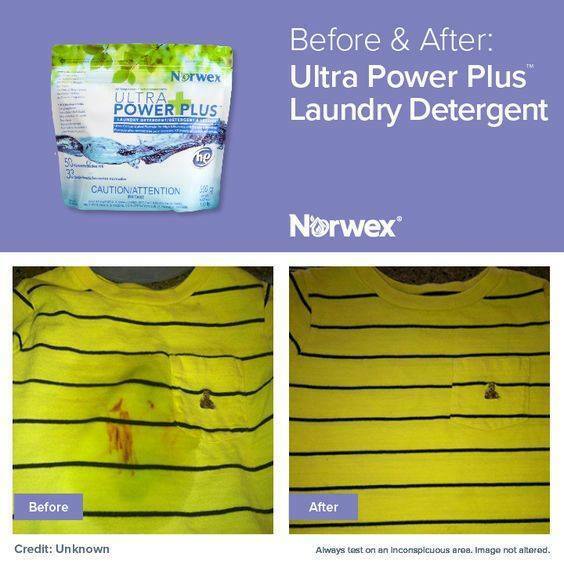 Needless to say Norwex washing detergent does not contain fillers or fragrances. It is also without sulfates (so no SLS or SLES), phosphates, chlorine bleach, optical brighteners, enzymes, or animal testing. And yet, it works REALLY WELL! Take a look at the before and afters below. And because it is without the harsh chemicals, you can use it with your woolens and delicates as well as your everyday laundry, so you don’t need a separate detergent for them. AND you can use it as a pre-soaker too! And best of all? You don’t use very much at all, so it is super cost effective! An average load in a front loader in moderately hard water uses about 1 tsp. At that rate, one 1kg bag will do almost a year’s worth of laundry at one load a day. Of course, top loaders use more, because they use more water – I would start with one tablespoon and then experiment from there. (Or check out my instructions here). My family of 5 goes through one bag in about 4 months, and that’s in a large top loader. If you’d like to try out the Norwex washing powder with our 60 day satisfaction guarantee, you can buy it here, in Australia, or check out Norwex.com if you are elsewhere in the world. *In my almost five years with Norwex, I have only every had ONE person who couldn’t use the Norwex laundry powder. 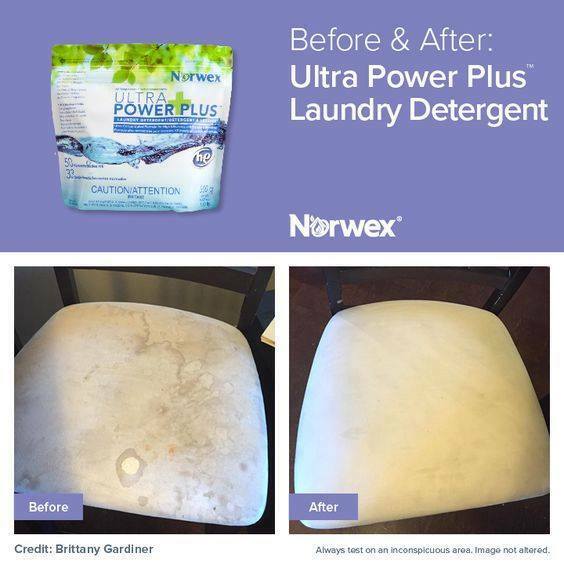 She told me she reacted to EVERYTHING, but so did her daughter, and her daughter had found the Norwex washing powder great, so she thought she’d give it a try. Sadly, she even reacted to it. Luckily we have our 60 day money back satisfaction guarantee, so you can comfortably try it, knowing you can always return it, no questions asked!